Hey Viper. I logged into a friends account to look at something for them, and when I logged back into mine all my decks have gone. Is there any way to get them back? i noticed that if i import a build that contains an elite passive that i havent unlocked yet and i load that build, i get the error "you have already equipped 1 elite passive ability" when switching back to a build that contains an elite passive that i have unlocked and the spot for that elite passive is blank. i cant manually add an elite passive at this point either. i tried adding all non elite passives to clear out the error then adding an elite passive back manually, no go. tried loading a build with an elite passive that i have unlocked, no go. there seems to be a stuck elite passive that cant be removed when loading a build containing an elite passive that you havent unlocked yet. restarting the game corrects the issue. Installing exactly as per the instructions results in no icon at the top of the screen. If I use /vdm then I get a reply that says something about <false> to <true> and vice versa. Have you made sure to clean out any old XML entries from \Customized\? If there's still XML files there you need to remove entries related to VDM from there as well, otherwise it will not work. Add-on Manager is only available with Topbar Information Overload. Yes i have deinstall customui , same Problem. Some of my Cabalmembers have the same problem. We have the German Client , could this be the Problem. I don't see that the German client should be a problem. The code doesn't change language, so yeah. But very odd... Can you give me some more detailed information? Is it happening with all decks or only some decks? And if so could you possibly export a faulty deck to me so I can check? Last edited by snap : 08-09-2012 at 05:13 PM. No , i have all Abilities i wantto load. The same problem as in customUI. Everytime when i died or go in Instance i have Black buttons under my Action Buttons. The Author of the Addon has fix this. Here i have the same problem. Everytime i load a deck (i have all Abilities) i become Black buttons under my Action Buttons. it looks like a clone of the Action Buttons , when i change the Transperence of the Action buttons , the Black buttons are the same like the ActionButtons. i have than a clone of the Action button. i have no Blank Abilities Slots , the Black Buttons are under my Abilities Slots. Have you tried this without using Custom UI? It sounds to me that there's something fishy going on. 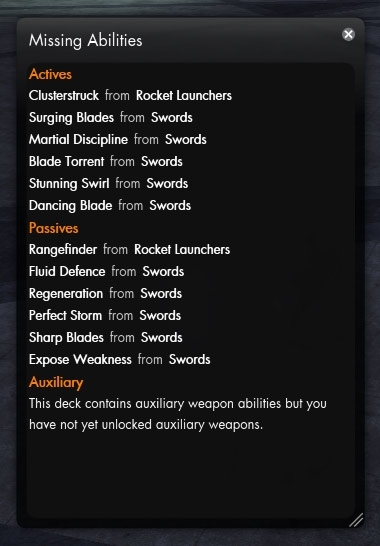 When you load a deck with Deck Manager it will first unequip all abilities and then equip the ones you loaded. If they start turning black instead of just blank then it's out of my hands, as I do nothing that could directly cause this. 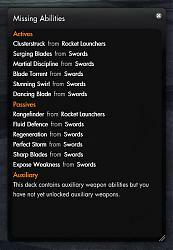 I just unequip and equip with functions used by Funcom. Last edited by snap : 08-09-2012 at 07:06 AM. Hello , great Addon , but always when i load a Deck i have black Buttons under my Action Buttons. Then only a reloadui helps me. Do you have an Idea what that can be or how i can fix it? The reasons I know of blank ability slots are if you try to load a deck with an epic ability you don't have or just plain abilities you don't have - that will leave them blank. If you see it outside of this I would very much like to know more about what you are experiencing to try and solve it. Also had the no icon issue, but read your reply on the official forums. Shift+Click the name of an add-on in the add-on manager to add it to the topbar. Last edited by Devla : 08-08-2012 at 06:18 PM. The game was not running. 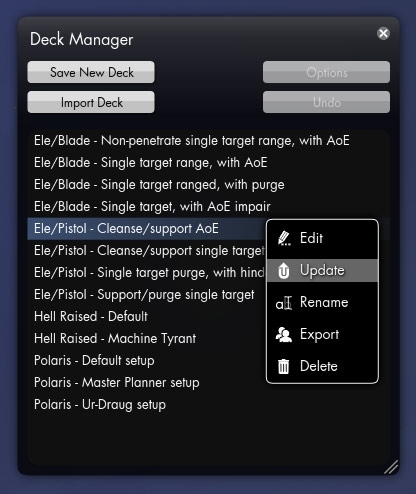 I deleted the files for Deck manager v1.1.1 then installed v1.1.2. 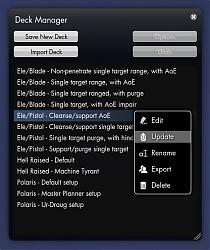 I can access deck manager through menu > addon manager and it works fine. Last edited by Tachy : 08-08-2012 at 05:40 PM. - fast switch: rather than click, dialog opens and then click load, right click in the main list just swap and then close the list dialog. Look forward to your revamp!